Brandon Turkus April 30, 2018 Comment Now! It took years for Americans to embrace Japanese performance cars and the different philosophy behind them. If the 2018 Kia Stinger GT is any indication, it won't take South Korea nearly as long to gain a foothold with American performance shoppers. That's because there's something intrinsically American in the way the Stinger GT drives. It feels like a muscle car, like a downsized, twin-turbocharged Dodge Challenger. 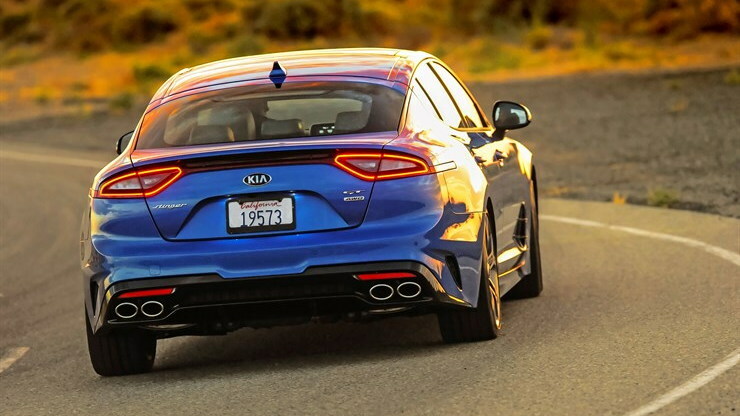 This Kia doesn't have the soundtrack to support the designation, but it has the straight-line speed, the sensation of acceleration, the in-your-face looks, and the affordable price that define a muscle car. I spent 226 miles behind the wheel of the most affordable V-6-powered Stinger, my second stint with the car following Motor Authority's Best Car to Buy testing back in October. The following are some observations on what it's like to live with Kia's appealing hatchback––it's not a coupe or even a sedan, so stop calling it either. The Good: Boy, this 3.3-liter, twin-turbocharged V-6 has some punch. A 3,800-pound car with 365 horsepower and 376 pound-feet of torque guarantees a good time. Accelerating from stoplight to stoplight is the Stinger's favorite pastime because that's where it can exploit its fat, juicy torque curve––peak twist is available from 1,300 to 4,500 rpm. Zero to 60 mph takes just 4.7 seconds. The Stinger GT is addicting in its quickness. The Bad: If I were to take delivery of a Stinger GT my first stop would be to the local tuning shop. This car desperately needs an exhaust note to match its straight-line speed. 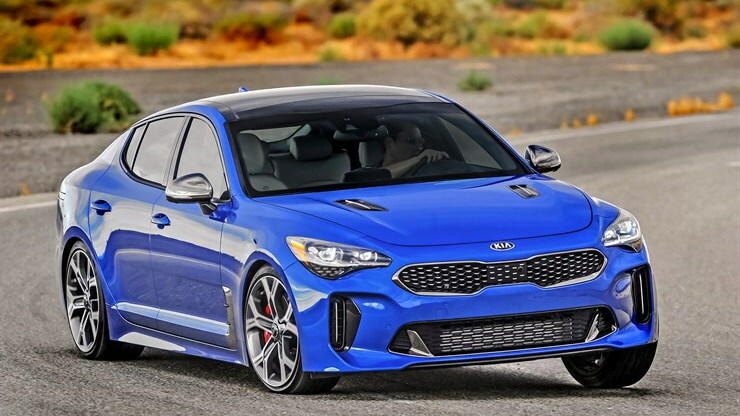 It feels like Kia, in a bid to match the BMW 4-Series Gran Coupe the brand desperately wishes we'd compare the Stinger with, took a bit too much inspiration from the Germans in developing a smooth, refined exhaust note for its new car. But the Stinger needs a rowdy, boisterous exhaust note. Based on skimming some YouTube videos, a free-flowing aftermarket exhaust makes the Stinger GT sound like a cut-rate Alfa Romeo Giulia Quadrifoglio...in a good way. It’s the one area where the Stinger fails to live up to its muscle-car aspirations. The Good: The Stinger GT's 8-speed automatic is much better on public roads than on a track. Shifts aren't as quick or aggressive as the ZF-built 8-speed in the Dodge Charger (and a whole bunch of other stuff), but it never feels like the Stinger needs that kind of capability. It's a likable everyday transmission. Leave the Stinger GT in Normal mode with the shifter in Drive, and the 8-speed auto is an innocuous partner. The Bad: The Stinger GT may not need the ZF's rapid-fire shifts, but man, I wanted them. The transmission holds this car back from feeling sharper, more immediate, and more unrelenting in its performance. 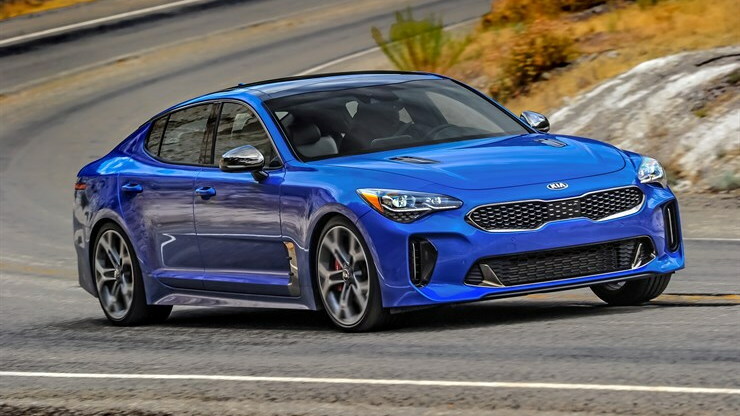 Kia could also stand to improve its paddle shifters––the wheel-mounted units lack the solid, bolt-action feel found in similarly priced vehicles. It's also a little annoying that Kia limits its fancy electronic shift lever to the range-topping GT2 (although that's merely a personal gripe––I just don't like the look or feel of the traditional lever). Finally, I wouldn't be doing my job as an auto writer if I didn't complain about the lack of a manual transmission. I say this not (only) because it's expected, but because a good 6-speed manual could have a transformative effect on the Stinger GT in the same way that a better automatic would. The Good: I love the way the Stinger looks, but to see how the general public would react, I parked it outside a bar on St. Patrick's Day where about 50 of my friends gathered to pretend we were Irish (and where the Kia sat until the next morning––don't drink and drive, friends). Who better than drunk 20- and 30-somethings to judge automotive design, right? My Micro Blue tester, with its big wheels, dark chrome trim, and sumptuous shape stood out. A friend who owns a Giulia ask to get a closer look. People who had no interest in cars stopped and gawked. The Stinger looks good enough to pull drunk people away from cheap green beer. The Bad: Rather than one overarching point, a bunch of little ones irked me and my inebriated friends. The hood “vents” are hilariously fake––they don’t even have holes to give the impression of functionality. The way a slim strip of taillight extends into the rear quarter panels is awkward and drew questions. 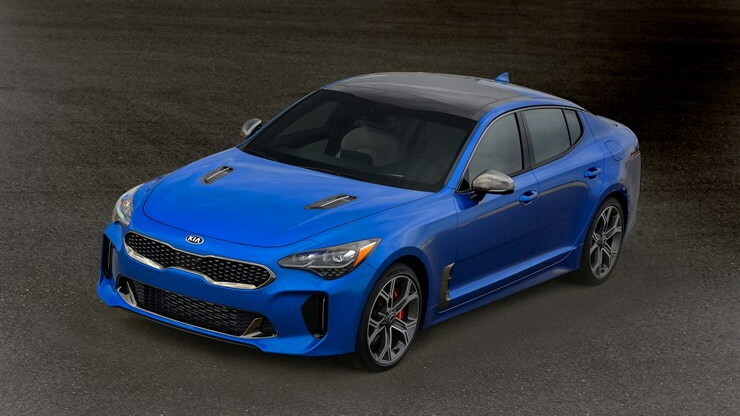 Finally, I've now seen the Stinger in Micro Blue and HiChroma Red, neither of which look anything like they do on Kia's online configurator. The blue is a bright, expressive color, like a slightly darker and more metallic take on Ford's Grabber Blue. HiChroma Red is not a deep candy apple, but rather a more traditional Rosso Corsa-like hue. Before placing an order, make sure to check out the paint in person. The Good: Kia nailed the driving position. The low, supportive seat and D-shaped steering wheel are perfect for the business of driving. The rest of the cabin is also fittingly upscale. Materials quality felt good in my sub-$40,000 test model, though some of the hard plastics might be less tolerable for customers of a fully loaded Stinger GT2. The Bad: I was the only person to take a seat in the Stinger and not complain about the ingress and egress. Regardless of the seat, every person, man or woman, tall or short, skinny or fat, complained about how difficult it was to get in and out of the Stinger. The Good: The base Stinger GT is a bargain. With prices starting at $39,250 (including a mandatory $900 destination charge), the cheapest V-6 trim has everything I could possibly ask for: 19-inch wheels, Brembo brakes, LED headlights, heated leather seats, and a 7.0-inch touchscreen with Apple CarPlay and Android Auto. That's in addition to the 365-hp engine, of course. For under $40,000, it's a stunning bargain. And in a move that we wish American brands would emulate, a whole host of active safety systems is available on every model. For $2,000, the usual alphabet soup of active safety systems comes in one package, regardless of engine. 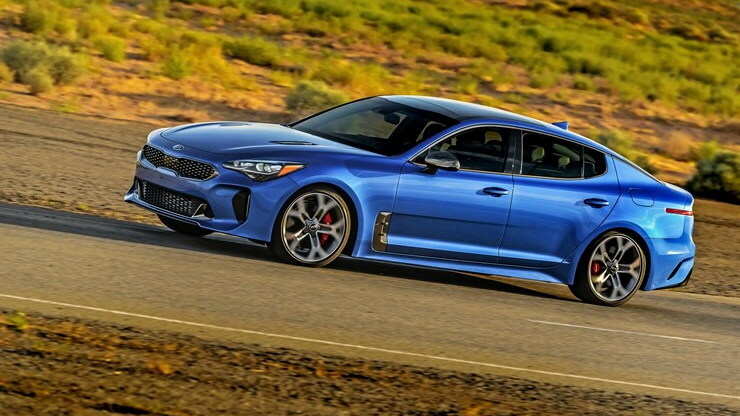 The Bad: Buying a Stinger requires walking into a Kia dealer. While Kia has firmly established that it offers well-built, handsomely equipped automobiles, its dealers are woefully behind the times. Reddit’s r/Cars sub is awash in horror stories about Kia dealers and their overly aggressive sales tactics in threads that date back years. Here in metro Detroit, the local dealers routinely promote buy-one-get-one-free offers on Fortes and make outrageous claims to finance anyone with a pulse. Slimy dealerships represent every automaker, but it seems like Kia’s ratio of good to bad dealers is heavily skewed the wrong way.